Differential Pressure Switch for ventilation systems is used for optimization of airflow. In building technology, the importance of energy management is continuously increasing. The need for action by the respective industrial company is prompted due to rising energy costs. The optimization and reduction of circulation volumes allows ventilation system to be designed smaller and leads to lower electricity consumption. The major part of existing industrial ventilation systems operates under unregulated full load conditions. In the context of energy optimization the obvious choice, instead of the unregulated mode of system operation , is to decide in favor of the regulated mode by controlling the ventilation system in accordance with the required air volume. ALVI Technologies offers a range of various measuring devices allowing the storage of the characteristic curves according to ventilation fans in the form of so-called value pairs (K-value) by means of a table function. Special ventilator characteristic curves can be stored in via a support point table. Depending upon the requirement, the device can have a signal output, switching output and optionally a linear characteristic curve for filter monitoring or square root extracted characteristic curves of the controlled volume flow measurement. For further information, please download our datasheets DE44 and DE45. 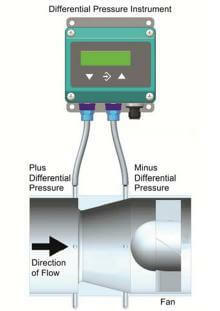 Previous Previous post: Differential Pressure Transmitter DE13 improves process efficiency by filter monitoring! Next Next post: Pressure measurement of liquids and gases up to 250 bar For a Nuclear Power Plant.